GALENA ? Investigators continued their search on Wednesday for two Oklahoma teenagers who have been missing for more than five years. 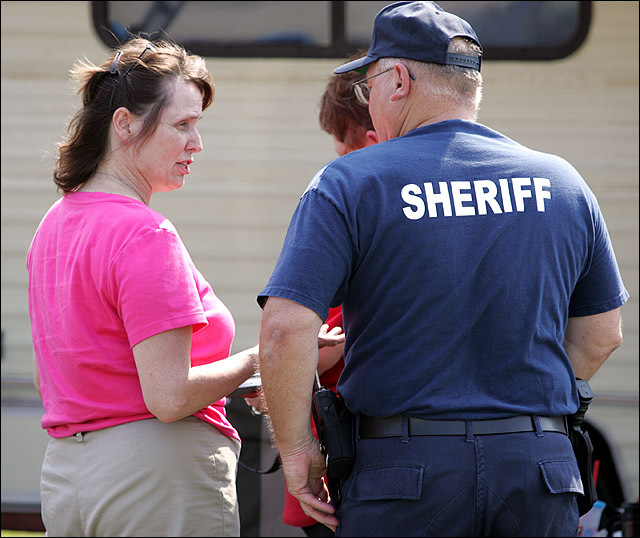 Lorene Bible, mother of missing teenager Lauria Bible, talks with Craig County, Okla., Sheriff Jimmie Sooter after a briefing on the progress of search efforts in a Galena mining field. Authorities are searching the former mining area in southeast Kansas after talking with suspected killer Jeremy Jones. Lauria Bible and her friend Ashley Freeman disappeared in 1999. Kyle Smith, director of public and governmental affairs for the Kansas Bureau of Investigation, said investigators had not discovered any evidence by midafternoon and were taking a break to allow overheating cadaver dogs to rest. Smith said investigators planned to return to the site today for what would likely be the final day of the search. Officers from 10 agencies began looking for Ashley Freeman and Lauria Bible on Tuesday using a camera to search a water-filled mine shaft. The two 16-year-olds went missing in December 1999 when Freeman’s parents, Danny and Kathy Freeman, were found dead in the smoldering ruins of their Welch, Okla., trailer home. Investigators came to the trash dump in the former mining area of southeastern Kansas after suspected serial killer Jeremy Bryan Jones allegedly told investigators to look for the girls’ bodies there. Jones, who formerly lived in Miami in northeastern Oklahoma, remains jailed in Mobile, Ala., where he faces a murder charge. He also faces charges for slayings in Louisiana and Georgia, but has not been charged in the Oklahoma case. Craig County Sheriff Jimmie Sooter said Jones, 32, has confessed to killing Danny and Kathy Freeman, setting their home on fire and then posing as a rescuer to the fleeing girls. Sooter said Jones told him he shot the girls before dumping their bodies in Kansas. But Jones recently told The Joplin (Mo.) Globe that he hadn’t confessed to any killings and that the search was a waste of time.